Weighty Matters: Badvertising: Dairy Queen's Triple Berry Julius - More Sugar Than a GALLON of Berries! Badvertising: Dairy Queen's Triple Berry Julius - More Sugar Than a GALLON of Berries! Looking at the nutrition breakdown of Dairy Queen's new "Julius Original" smoothies that the ad up above suggests are fruits I couldn't help but make some comparisons. Their large "Triple Berry" Julius Original smoothie? At 920 calories (with no "boosts") it has the caloric equivalent of nearly two large Dairy Queen chocolate sundaes and with 48 teaspoons of sugar (a full cup), it packs the sugar equivalent of more than a gallon of actual mixed berries (and nearly 3.5x their calories). 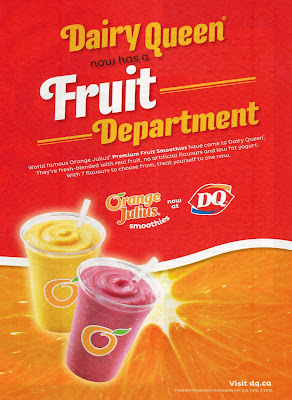 So no Dairy Queen, your smoothies don't give you a "fruit" department, but they do give you a badvertising one.